Ever flown through a really busy airport? With all the planes and people and equipment constantly coming and going, it can be really intimidating! There are planes lined up for taking off or stacked up for landing; other planes are either taxiing out or are making their way into the gates. Look around and you see a dizzying array of people, vehicles, food, fuel, and luggage in constant motion. How do they keep up with everything? From where is it possible to see how best to keep the departures and the arrivals in synchronization? Look around any major airport and you will see a busy Control Tower, where Air Traffic Controllers (ATC’s) are able to meet and manage the challenges of running their busy daily schedules. Have you ever thought of how ATC’s are like your company’s Production Planners and Schedulers? From the Control Tower, the ATC’s handle anything from unexpected emergencies, computer simulations, and the constant flow of planes, machines, and people, while best sequencing the flow of airport operations. There are three goals of Air Traffic Control: to meet On–Time Arrivals & On–Time Departures; to maximize the utilization of planes, equipment, and labor; and to minimize the impact of weather, delays, and lack of resource availability. Think about how having a Control Tower’s view of your production operations could help you meet those same three objectives! In order to sequence the schedules for the best throughput from your factories, someone has to have a “Control Tower’s” view of your operations, so they can properly balance, allocate, prioritize, and optimize your company’s limited equipment, labor, and materials capacities. But what happens when drastic changes – the “hot rush job,” unplanned machine stoppages, or other disruptions – are forced on those schedules? Have you heard any of these from your production people? “For this week’s production, our supervisors schedule based on what they actually produced last week. “I know the scheduling information is in there, but I just can’t answer ‘the question. Printed reports for production to use. Meet – customer order due dates. Maximize – utilization of machine, labor, and materials. What if you had the “Control Tower” perspective on your operations to meet these three goals? your inventory cushions, and squeeze more production capacity out of your shop floor? Datatex Machine Queue Management (MQM) is just the tool to provide this visibility across all aspects of your textile and apparel production chain. It gives reliability to the production plan, allowing your people to respond best to inevitable changes in the schedule. MQM is a powerful, flexible decision support tool that portrays current shop floor conditions with color – coded images to give instant insight into what is happening. In order to optimize future production schedules, MQM allows you to run simulations /“what if” scenarios, to choose the best plan to send to the shop floor. It integrates to / from ERP systems to give a coherent view of production (“one trusted source of information used by many”). Whether you have need for a single scheduler for one facility, or need support for multiple departmental users across multiple facilities, MQM provides critical capabilities. Because textiles and apparel is at the core of Datatex business, this tool supports both Continuous and Batch operations (with capacities and batch sizes). Auto sequencing allows the scheduler to have MQM to place jobs / steps onto the Plan, while taking into consideration any of several factors: meeting delivery dates, meeting machine efficiency targets, best use of current machine setup, change – over times, color scale from light to dark (for dyeing operations), order priorities, or capacity restraints, etc. MQM allows the scheduler to dynamically adjust and revise the production schedule with synchronization tools. Because the tool is bi – directional, it allows the scheduler to know how much of a job’s quantity has been completed, or if a machine is running faster or slower than expected. This brings crucial visibility across the entire production chain, as well as trustworthiness to the schedules. By increasing the reliability and workability of the scheduled output, machine operators and departmental supervisors learn to trust the information they are given. Comparing properties of the step to jobs already scheduled (sizes, colors, materials, tools, work crews, etc.). Allowing overlapping operations (examples- where the machine must be loaded with at least a certain minimum quantity, or must receive at least a certain quantity to begin, or the produced goods must stay at least a certain time after the job step is completed, or the produced goods must be forwarded to the next step before the end of a certain period). Additionally, MQM supports the capability to schedule jobs on a resource while still checking the future availability of raw materials –either from stock, other machine schedules, or from purchase order receipts. Splitting a job across multiple machines. Splitting an individual machine down into smaller time – dependent groups. Grouping smaller quantities into a larger batch. This gives the best queuing for the needed schedule. To minimize Work In Process (WIP) inventory - Allows sequencing of steps at the latest possible time (optional), so that the order will automatically progress to the next step of production. While MQM is used to optimize multiple steps of a production order, it schedules / sequences one step at a time. You have the capability to first schedule your known scarce resource, and follow that will other steps either before or after the bottleneck. The scheduler can synchronize demand either before (upstream) or after (downstream) the scarce resource to better balance operations, lower W I P inventory, and decrease throughput times. This reduces requirements for buffered inventory, or the material handling charges associated with it. To give immediate notification of production steps that will be delayed, using lead and queue time definitions for both the step and / or the entire production order. Full “downtime” support allows the scheduler to reschedule uncompleted jobs to alternative work center processes. By proactively re – routing these uncompleted jobs to alternative work centers, the scheduler becomes the hero to customer service and sales people! To run on the optimal resource - By checking the characteristics of the step to be scheduled versus the resource characteristics, using the property rules mechanism. Dynamic sequencing allows the scheduler to schedule around scarce resources, so that orders are not released into production too early, which reduces lead times and W I P inventory. Conversely, the scheduler can identify and place new jobs at under – scheduled work centers. MQM can either be interfaced for two – way communication to the host ERP system, or it can run in a ‘stand alone’ mode. MQM resides on individual schedulers’ Windows – based PC’s, and uses our memory – resident engine with synchronization and scheduling algorithms that produce the best possible, yet achievable plans. On the PC screen, the Scheduler can see a detailed view of two main sources of information: a) the Gantt / Plan that shows selected work centers / resources and all jobs currently scheduled across a configurable calendar (down to the machine level); and b) the Bin, a detailed listing of scheduled and unscheduledproduction order steps. MQM’s machine - level calendar support includes – shifts, working/non – working hours, holidays, machine maintenance, unplanned downtime / repairs, etc. The scheduler is presented with choices to allocate, rearrange, or reschedule production order steps onto the time scale of the Plan. These allocations can be done automatically for the entire Bin, or for one job; or they can be simulated or firm using the earliest or latest possible step dates, taking several time parameters into consideration. The scheduler will have visibility between the current setup of the machine to the needs of the particular step of the work order, or to capacity that has been reserved for a particular customer order or product. The scheduler will be able to compare the characteristics of adjacent jobs to the one being scheduled. Using information passed to it from the host ERP system, MQM will compare and highlight differences between expected completion times (either early or late), which will allow the scheduler to make the appropriate decisions. Because everything is color – coded, the scheduler can immediately see where problems lie, and can drill down to locate where attention needs to be focused. Designed to be highly intuitive, schedulers can simply “drag and drop” individual jobs onto the Plan, with advanced capabilities only a mouse click away. 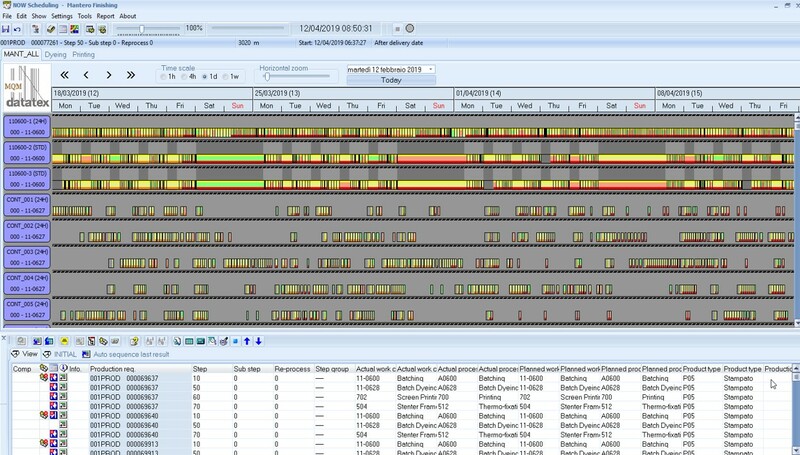 Alternately, with MQM’s configurable Auto Sequencing functionality, the scheduler can let the tool automatically place the jobs onto the Plan, after selecting different algorithms in the tool to optimize the calculated schedule for: customer delivery date, machine utilization or efficiency, or to minimize change – over / setup times. 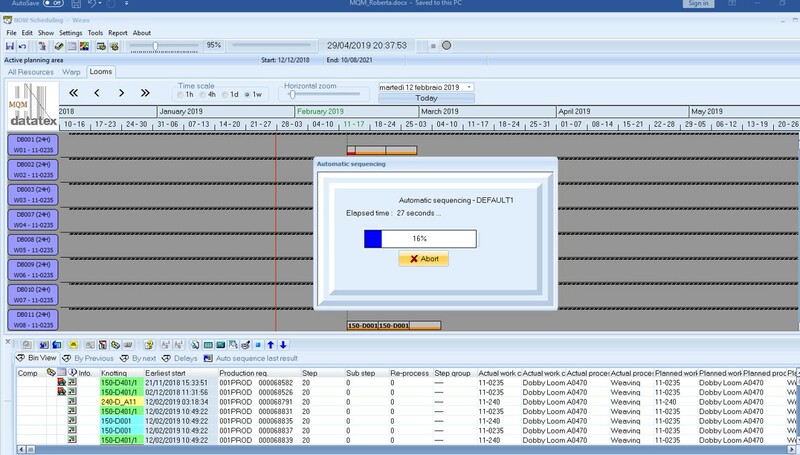 By running “what if” simulations on the PC, this Auto Sequencing capability offers your schedulers tremendous flexibility to test theirideas before sending them back to the host ERP / legacy system. Adaptable to ever changing conditions on the shop floor – unplanned disruptions to the schedule are easily handled with MQM, using: “downtime” support to recalculate projected job end times; or alternative work center processes, where the scheduler stops the job on the current machine, reports the completed production, and moves it to an available alternative work center – all the while monitoring the disruptions the downtime has on other orders on the plan. Monitor and measure schedule performance based on pre – defined factors (customer delivery dates, material availability, resource utilization, overtime, etc.) Schedulers learn to schedule against these key metrics, which positively affects the company’s bottom line. 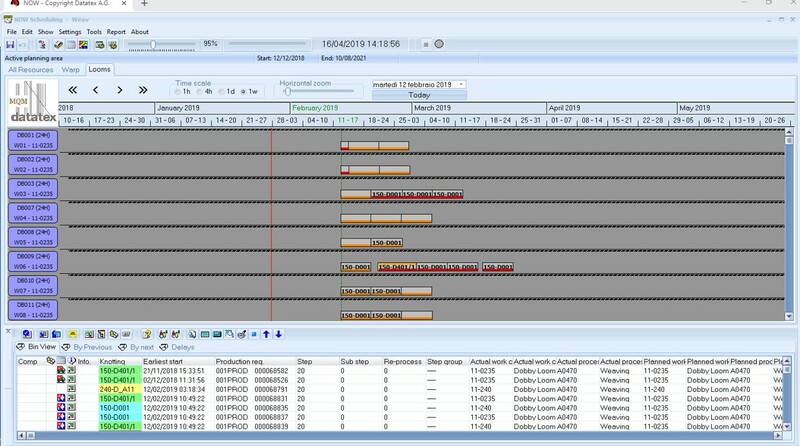 Using the Auto Sequencing functionality, customers have told us that this capability allows them to dramatically reduce planning effort and labor (by “expediters” who troubleshoot and locate missing orders and materials on the shop floor), allowing their schedulers to manage the exceptions not placed on the plan by the tool.